In her second year of studies at Merlin College, Oxford, Sophie Marshall is feeling alienated among fellow students who fail to welcome a woman to their ranks. So when her husband, Gray, is invited north as a visiting lecturer at the University in Din Edin, they leap at the chance. There, Sophie’s hunger for magical knowledge can finally be nourished. But soon, Sophie must put her newly learned skills to the test. Two years after the events of THE MIDNIGHT QUEEN, Sophie and Gray Marshall are studying hard at Merlin College of Magick in Oxford. But while Sophie is clearly a brilliant mind, there are many who believe that “females” should never have been granted admittance to the College, regardless of their royal status. Side note: why is it that only sexist people refer to women as females in casual conversation? Does anyone else’s skin crawl when people use that word? “Females.” Ugh. Needless to say, the sexist collegiate culture makes life in Oxford difficult for Sophie – and by extension, Gray is feeling pretty miserable as well. So it’s little wonder that the Marshalls jump at the chance to spend a year abroad in Alba (aka Scotland) at their magickal University where Gray will take a post as a teaching fellow and Sophie will complete her undergraduate studies. Many women attend university in Alba so Sophie can blend in, and few people know her parentage there…which is how she likes it. But secrets – especially royal secrets – never stay secret for long. Meanwhile Sophie’s younger sister Joanna remains in London, under the care of her Lord and Lady Kergabet. At fifteen, Joanne is starting to come into her own and has changed considerably since we last saw her. She still loves to bound about outdoors and get into scrapes, but her position as Lord Kergabet’s assistant/protégé at court requires her to keep up appearances. Joanna becomes very involved in politics and is sworn to keep the court’s secrets, but can she really keep Sophie in the dark when she learns of unrest in Alba? Seeing Joanna all grown up and making some (slightly) more rational decisions was a treat, although I confess that I did miss her sass a bit. 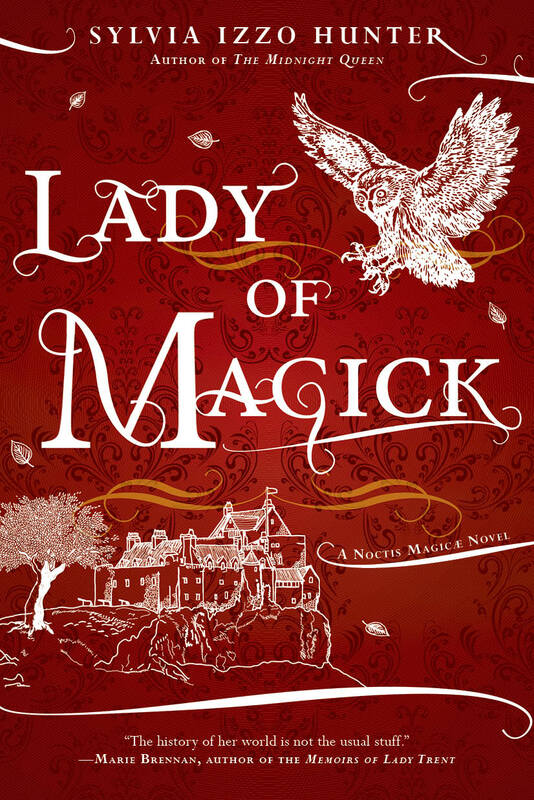 LADY OF MAGICK introduces a new kingdom in the Noctis Magicae world, and does a wonderful job of expanding the alternate UK that Sylvia Izzo Hunter established in the first book. I especially loved how she develops the political tensions between England and Alba, and how those tensions impact Sophie and Gray’s new friendships. I’ve always been really interested in Scottish history and I was very impressed by the amount of research that went into writing this. If you have even a passing interest in Regency era Scotland, I promise you’ll find Alba and its people absolutely riveting. Another thing that I loved about LADY OF MAGICK is the emphasis placed on scholarship. Let’s be real: most books that take place at university conveniently exclude all of the studying and reading and essay writing that is entailed. Not so in this series! Not only is Sophie studying for her undergrad, she’s also struggling to learn Gaelic so she can participate more fully in Alban society. Talk about a lot of homework. Although it shares many characteristics with England, Alban society is considerably more relaxed in terms of etiquette and its clan royalty. I really loved that because people were more open about difference, most notably people in queer romantic relationships. There’s a super adorable queer ship in LADY OF MAGICK that I was cheering for every step of the way, which made me happy because 1) diversity in historical SFF and 2) SFF needs more queer ships! This relationship was very well done and pretty subtly wrought, definitely a treat to read. If you enjoyed Sylvia Izzo Hunter’s debut novel QUEEN OF MIDNIGHT then you won’t be disappointed with LADY OF MAGICK. It is just as well written and atmospheric, and expands on world building and characters alike. If you’re not reading this series and you like historical fantasy, I highly recommend it! Have you read any SFF set in Scotland? If so, please recommend me some in the comments! I’ve got a hankering to read more. I’d love to start this series, I just haven’t had time. I do have a copy of Queen of Midnight, though! I’m glad the second book lives up to it. I hear you! Starting a new series can be so daunting what with all the new releases flying off the shelves. I’m enjoying this series a lot, so if you find yourself with a break in your reading schedule and a hankering for historical SFF, I definitely recommend this series! I love the sound of this and hadn’t heard of this series before – of course, whether I should actually take on yet another series is debatable and probably not the brightest idea at the moment, but I do like Historical SFF! I think you’ll really enjoy Sorcerer to the Crown – it’s not trying to be historically correct at all but it’s good fun and has an Austen/Clarke feel to it – but more modern in terms of writing style.